The new 2nd Floor in NYC serves P’tcha, a slow-cooked soup made with veal bone broth, garlic and fresh parsley that riffs on a traditional Ashkenazi Jewish dish. At Kachka in Portland, Ore., chef and owner Bonnie Morales serves the food of the former Soviet Union, including a modern take on her Belarusian family’s borscht recipe, which she grew up eating. Common in Morales’ family and currently on the menu at Kachka is a hot borscht made with beets and short ribs. She serves it as her family did, with a side of black bread and spicy mustard to be stirred into the soup. Borscht and other retro soups of Russian, Balkan and Eastern European cuisines are hot on restaurant menus right now (well, except when they are served cold). According to the latest research from Datassential, soup varieties such as borscht, matzo ball and goulash are appearing on more menus than last year. Like Morales, Jeremy Salamon draws on his heritage, in this case Hungarian, to craft the menu at The Eddy, a globally inspired neighborhood restaurant in New York City where he is executive chef. 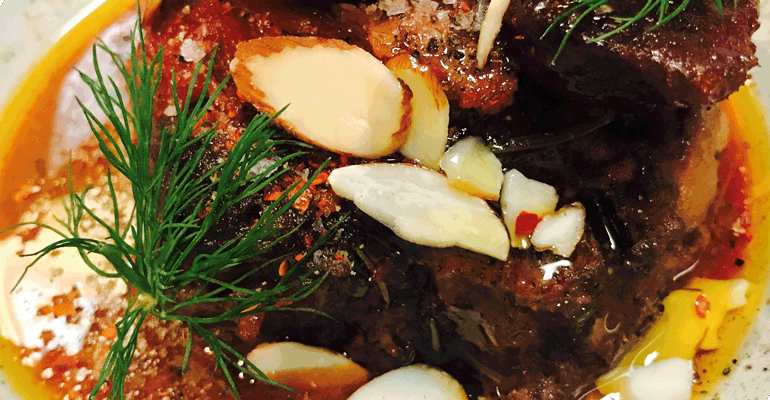 To that end, Salamon recently added to his menu an oxtail and ancho borscht with almonds, labneh and cilantro. At the Eddy in New York City, Executive Chef Jeremy Salomon translates his interest in Eastern European in soups into an Oxtail and Ancho Borscht with almonds, labneh and cilantro. Salamon also makes goulash, a Hungarian soup of meat and vegetables seasoned with paprika, and is looking forward to warmer weather when he will add his favorite Hungarian chilled cherry soup to the menu. Goulash is also on the menu at San Francisco’s Paprika, a Czech, Hungarian and German-influenced spot. The paprika goulash is made with tender pork and potato gnocchi. Both chefs and diners alike are more interested in these types of soups. According to Datassential's Global Flavors Keynote report, 66 percent of consumers are likely to order globally inspired soups. With borscht, it’s especially helpful that beets are trendy at the moment, according to Datassential. Among the factors driving diners’ renewed interest in older soups is a resurgence of modern diners, luncheonettes and Jewish delis, Datassential said. In November, brothers Jeremy and Josh Lebewohl, owners of New York City’s iconic 2nd Avenue Deli, opened 2nd Floor. Located directly above the Upper East Side location of the deli, 2nd Floor offers updated takes on Jewish deli classics, including soups, that the brothers grew up eating. While matzo ball soup is the signature dish at the deli, the upstairs menu features p’tcha, a spin on the traditional Ashkenazi Jewish dish made from boiled calves feet and served in gelatin form. The 2nd Floor version turns the dish into a slow-cooked soup made with veal bone broth, garlic and fresh parsley. A matzo ball-meets-wonton soup is on the menu at Nickel & Diner in New York City. Nickel & Diner, also in New York City, features elevated interpretations of American diner food, while incorporating the flavors and ingredients of the restaurant's nearby neighborhoods of Chinatown, Nolita and Soho. 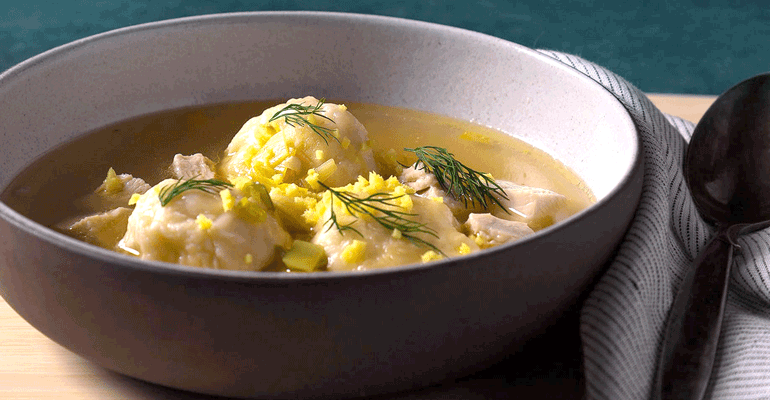 Chef James Friedberg's signature dish is a multicultural chicken soup, a “matzo ball wonton soup mashup,” made with a traditional chicken consommé base with roasted chicken breast, ricotta dumplings instead of matzo balls, and finished with fresh ginger, leeks and dill. Other chefs are finding that the versatility of these old-world soups allows them to play with on-trend ingredients, adding freshness to comforting old favorites. Rooster Soup Co. in Philadelphia, the brainchild of James Beard Award-winning chef Michael Solomonov and his partner Steve Cook, is a globally influenced retro luncheonette serving egg and cheese sandwiches, blue plate specials and, of course, matzo ball soup. The smoked matzo ball soup is made with a chicken stock flavored with turmeric and fenugreek, and topped with chopped dill. The stock is made from spare chicken parts leftover from making fried chicken sandwiches at the group’s Federal Donuts concept. Additionally, all profits go to support vulnerable Philadelphians through Broad Street Ministry’s Hospitality Collaborative. Mixing Old World and New World ingredients is the entire point of Ambar, Ivan Iricanin’s modern Balkan restaurant in Washington, D.C. A traditional Balkan veal soup made with organic veal and root vegetables, served with crème fraiche and a lemon wedge, is among the restaurant’s best-selling dishes. A menu of traditional and non-traditional Russian dishes inspired by family recipes, including borscht, are the focus of Teremok, a fast-casual chain founded in Moscow, in 1998, that recently opened its first location outside Russia, in New York City. The borscht is re-imagined for American diners with beets, carrots, cabbage, garlic, tomatoes, bacon, and a topping of sour cream and herbs. Also on Teremok’s menu is a Russian fish soup called ukha, a chowder made with smoked salmon, carrots, soft cheese, and topped with housemade chips and herbs. But it’s not only chefs and diners who grew up eating these soups who are ordering them. Morales counts among her patrons new immigrants from Russia, Belarus, Georgia and Ukraine, those who cry over their bowls because they haven’t had a particular dish since their grandmother passed, as well as people entirely new to Russian cuisine. Meanwhile, at 2nd Floor, Jeremy Lebewohl hopes to introduce a new generation to the foods he and his brother grew up eating.